Provides one RAID-1 and one JBOD hardware RAID function in same device. 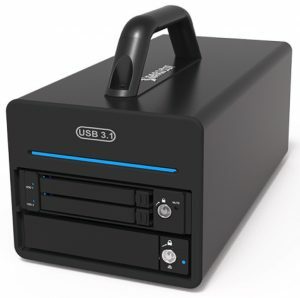 Stardom, a brand from Raidon Technology, Inc., releases an application concept for hardware RAID storage with USB 3.1 Gen2 interface - DR3-B31, that comes with one USB 3.1 Gen2 Type C interface with high data transfer bandwidth and provides both one RAID-1 and one JBOD hardware RAID function in the same device. With the USB 3.1 Gen2 Type C interface, DR3-B31 provides the data transfer bandwidth up to 10Gb/s, which is two times faster than USB 3.1 Gen1 or USB 3.0. And with the reversible Type C connector, it is more convenient for use. DR3-B31 can provide both one RAID-1 and one JBOD, two RAID applications at the same time, same device with one cable. For RAID-1 group, user can use two 2.5-inch SATA drives and keep the data be saved. And use SSD for better performance. For JBOD drive, user can use one 3.5-inch or 2.5-inch SATA drive and make the data be movable by using with the firm's tray modules. It also comes with the company’s standard Aluminum handle for user to move the storage easier.